One of the key priorities for the Knowsley Safeguarding Children Board is to assist all who work with children and families in assessing child neglect. The original Graded Care Profile tool was introduced in Knowsley in 2015. Following a rigorous review of the current tool by the NSPCC a number of improvements have been made and the GCP2 has been launched. The GCP2retains the core concepts, design and structure of the original GCP but adds value in relation to new, more accessible language. It now includes new ‘items’ such as obesity and online safety and still focuses on strengths and concerns. 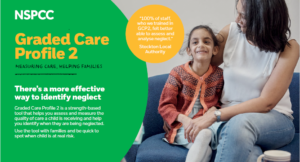 The GCP2 is a practical tool which supports practitioners in measuring the quality of care delivered to an individual child from a carer/s over a short window of time and is designed to give a representative overview of the current level of care. The grades are based on observations and good quality evidence gathered. The GCP2 reviews “what it is like” for the child not “why it’s happening”. The lived experience of the child. Parental issues are taken into account during the analysis and planning stage. The quality of care is ‘graded’ on a scale of 1 (best) to 5 (worst). The GCP2 separates out different areas of parenting and the needs of the child: physical, such as quality of food, clothes and health, care of safety, safety in carers presence and when carer is absent, emotional care, such as the relationship between the carer and child and developmental care, such as if a child is encouraged to learn and if they a praised for doing something good. These areas are based on Maslow’s principals. The GCP2 has been rigorously evaluated and found to be reliable and valid. It can be used where neglect is suspected, giving a baseline measurement and can be used to target interventions and to monitor progress after interventions. It can be used for all ages of children, including adolescents. The majority of children subject to child protection plans in Knowsley are under the category of neglect. The aim of this tool is to assist staff in undertaking a comprehensive and evidence based assessment of families when neglect is known or suspected and particular emphasis should be given when neglect is first identified at early help. If you would like more information please access the NSPCC website. It is a requirement that practitioners that will be utilising the GCP2 will do so either via the Children’s Social Care ICS system or the Early Help Module. Please see below if you will access the tool via EHM.